"Oh look. You've gone and let the wood man in again." 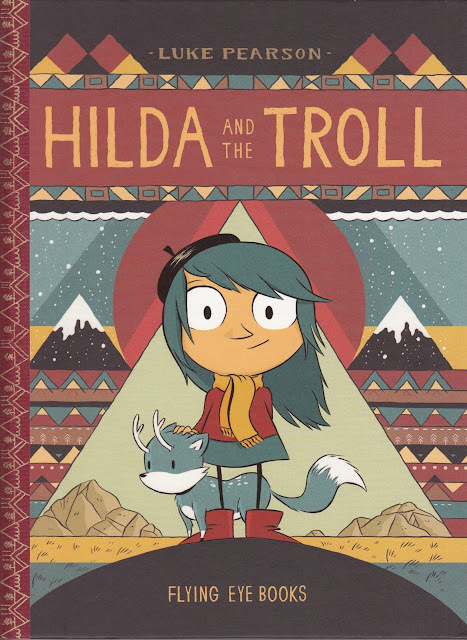 Another installment in Luke Pearson's graphic novel Hilda series for young readers. Hilda and the Troll features a blue-haired, artistic Scandinavian girl with a vivid imagination who sees her drawings and daydreams coming to life. Hilda's fantasies fill the page, blurring fiction and reality, as she sets off on an adventure filled with curious worlds, peculiar new friends, and the hope of returning home. Once she steps outside her front door, Hilda's journey begins. Pearson's bright colored illustrations help readers participate in Hilda's other-worldly exploration as both story and pictures encourage readers to use their own imagination as they more vividly enjoy the world in which they live.